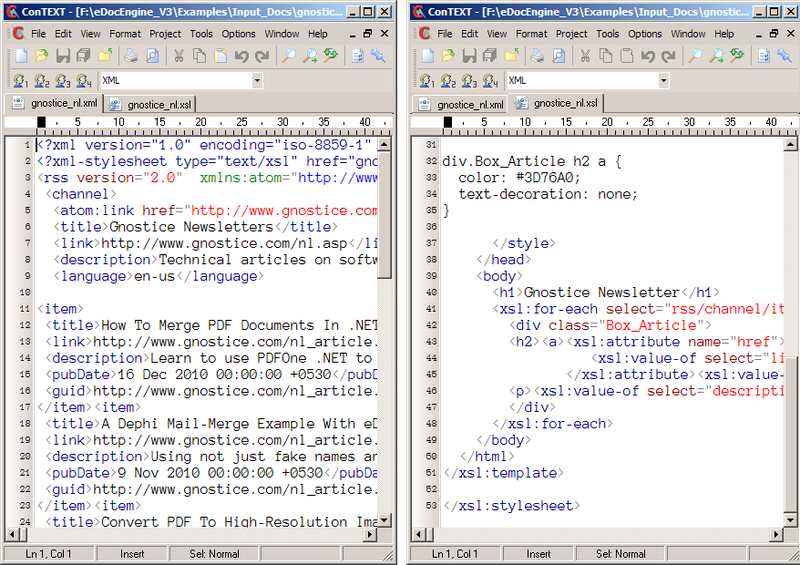 If you are familiar with XML and XSLT, then you also know that transformed XML documents can be displayed inside a web browser just like a web page. 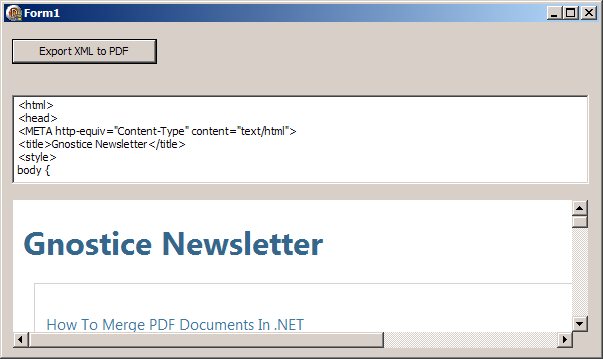 Well, it does not stop with transformed XML. A lot of people have been asking us about exporting XML to PDF and other formats. And, here is our solution. Our solution uses an old Delphi component called THTMLViewer. THTMLViewer is no longer under development by its original authors. The last update from them was for Delphi 2006. However, the authors had made the project open source. There is a Delphi 2009 update for the component from the good folks at www.songbeamer.com/delphi/. Before you try our solution, you need to install the new THTMLViewer and then recompile eDocEngine's export interface component for THTMLViewer - TgtHtmlViewInterface. The test XML and XSL files used in our example code are named gnostice_nl.xsl and placed in the project folder. (You can use any XML and XSL file so long as the THTMLViewer can display it without problem.) Here are the steps for creating the Delphi application. 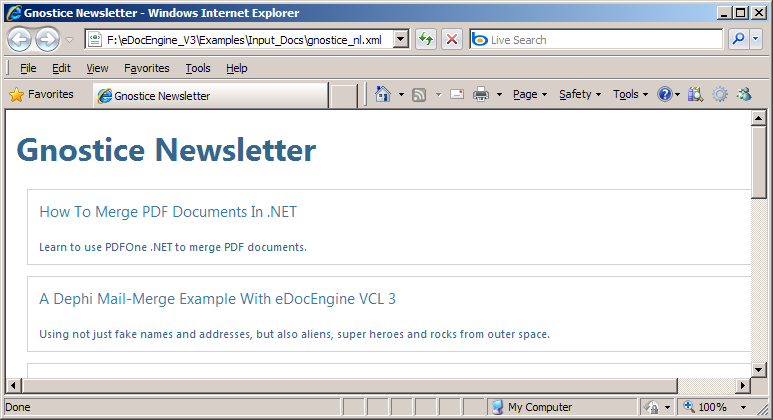 Open the IDE and create a VCL forms application project. Drop the following components on the form. Add the following click-event handler for the button. 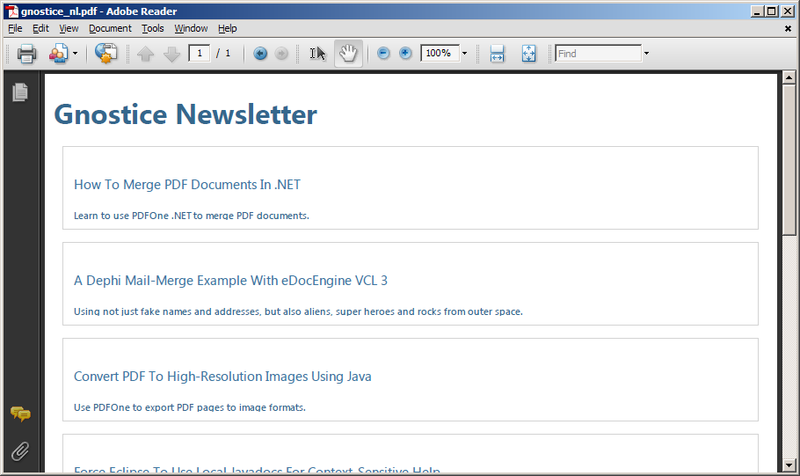 Click the button - to transform the XML to HTML, display the HTML in the viewer, and finally to export the displayed contents of the viewer to PDF using eDocEngine. Here is the final output.